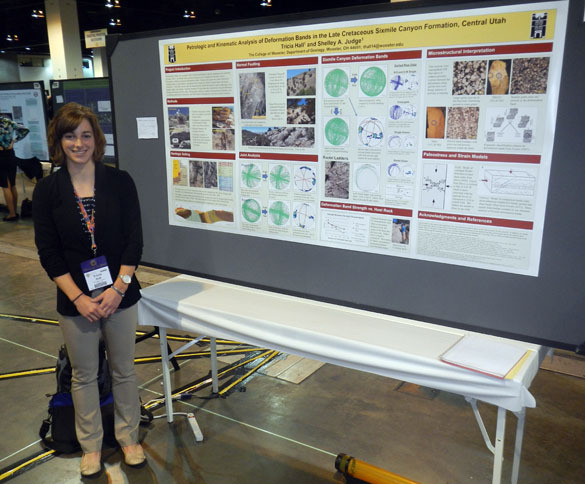 DENVER, COLORADO–Tricia Hall (’14) stands before her 2013 Geological Society of America poster: “Petrologic and kinematic analysis of deformation bands in the Late Cretaceous Sixmile Canyon Formation, central Utah“. She worked hard this summer with Dr. Shelley Judge pounding away at deformation bands to use them as keys to sorting through complex structural events. 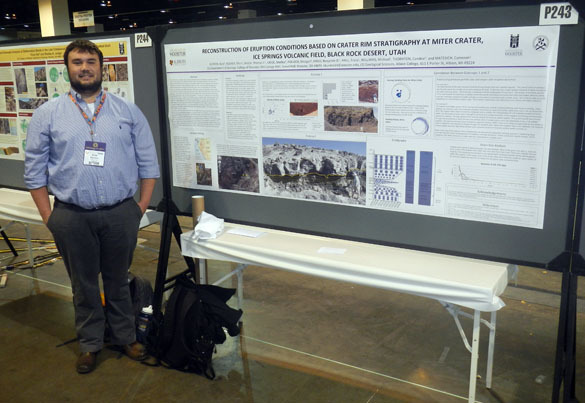 Kyle Burden (’14) is below with his collaborative poster: “Reconstruction of eruption conditions based on crater rim stratigraphy at Miter Crater, Ice Springs Volcanic Field, Black Rock Desert, Utah“. Michael Williams (’16), Candy Thornton (’14) and Cam Matesich (’14) are also co-authors on this presentation of summer work in the Black Rock Desert with Dr. Judge and Dr. Pollock, along with students and faculty from Albion College. Team Utah closed out the 2013 Wooster student presentations at the Geological Society of America annual meeting in Denver. The faculty is very pleased … and not a little exhausted!